Changing locations has everything to do with the initial successes of this year’s festival. A surprisingly impressive lineup looked just as good on paper as it did onstage. Opening acts like locals Vundabar or indie rock swooner Lucy Dacus had unexpected breadth onstage, flushing out their sound with a wholeness impossible to achieve within the stone walls of City Hall. Armed with a light show beyond description, Sigur Ros put on a performance that felt like a time capsule, bringing fans to their home of Iceland with old songs like “Vaka” and newer, dramatic opuses. 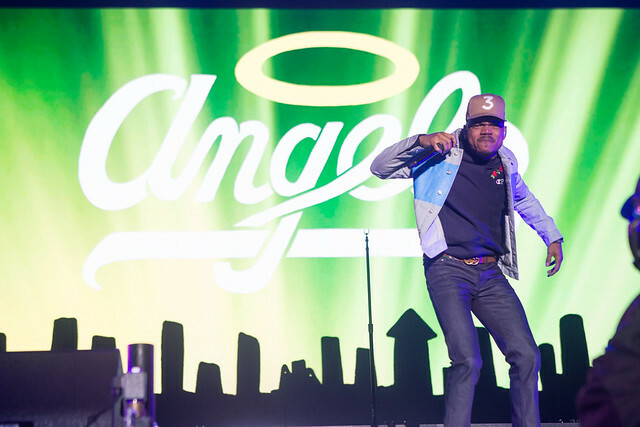 Closing out the night was Chance the Rapper, an artist who capitalized on the new headlining stage’s size: fireworks launched into the crowd, confetti exploded above their heads, and he sprinted back and forth, bringing gospel-sized goodness to a sea of people unbothered by the rain. With a larger location, the festival was able to promise bigger acts that their set not only would sound better, but it would look better, too. For those who don’t frequent smaller shows at places like Brighton Music Hall or Great Scott, some of the lower-billed acts took on a bigger commercial appearance. The spastic art rock of a band like Deerhoof felt like something worthy of paying attention to—which, of course, it was to begin with. Each member’s talent on their instrument became twice as memorable because the size of the stage and setup of the area builds them up to look famous, even when playing deep cuts that deviated from a traditional pop structure. Bands that have long deserved more attention were getting it. But the festival is clearly struggling to deal with the big-name festival status it set itself up for. Lines snaked around the complex, people reportedly waiting over an hour just to get inside the festival, despite multiple security lines set up. In the wake of the Manchester attack, extra attention to the safety of concertgoers is key, as it would be prior to the event anyway, but the logistics of getting people in held up those who purchased their ticket months in advance from seeing artists up close in personal. Instead, they had to listen to them from the back of a line, where even the biggest stage looked like a small black bubble in the distance. Once inside, a confusing setup made it unclear how to get from the two main stages to the smaller blue stage in back. Large signs, especially high up, would have helped. Don’t even ask what the food lines were like — and no, it didn’t matter what booth you were trying to get a meal from. In a way, this makes Solange’s last-minute cancellation easier to swallow. Though Migos weren’t the replacement they should have been, particularly live, it’s hard to imagine how many disappointed fans would’ve been caught outside the festival grounds. People who prepped to arrive early to get inside on time were stuck. Solange’s set no doubt would have been missing half of the audience that wanted to see her, purely because of failed logistical issues on the festival’s end. Make no mistake: growing pains are inevitable. It was almost guaranteed that Boston Calling would struggle to master the art of design, setup, and entry without any flaws. It’s the lack of revision, that sad increase in difficulty as the day went on, that made it hard to ignore that they aren’t quite ready for the big upgrades they gave themselves. Hopefully in the next two days, Boston Calling can figure out how to simplify the ground’s design setup and the entry process, at the very least so the people who purchased tickets—tickets that cost significantly more than previous years’—decide to buy some come next year’s lineup. The festival already sounds larger than any year before. It just needs to operate at a level that can accommodate the fanbase of musical talent this stacked.